Need to store cans in a shallow space? Don't care to build shelves? How about using plastic rain gutters instead? You get the benefit of a system that the cans won't fall off of in the event of an earthquake or explosion or similar event. 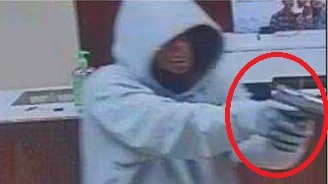 I want your to look closely at the frame capture included with this article on an armed robbery that took place here in the AO. Seeing as it's from a surveillance vid, I feel no copyright compunction about tossing it in here. I even helpfully circled the point of interest for you. Nice grip, isn't it? Matter of fact, it's a pretty nice presentation over all. Someone knows what they're doing. Probably had some training somewhere along the line. And now they're out robbing banks. Up your situational awareness and your carry game, folks.